During the rush to weed their way through the crowded field of 14 Mayoral candidates, voters chose one candidate who promised Reform and one with proven Experience. Candidates who seemed to be reform minded included, Lori Lightfoot, Willie Wilson, Amara Eniya,, LaShawn Ford, John Kolzar, and Neal Sales Griffin. Whereas, those who represented experience included, Toni Preckwinkle, Bill Daley, Gery Chico, Susana Mendoza, Paul Vallas, Garry McCarthy, and Bob Fioretti. Although from a Machine Organization background, Jerry Joyce was an oddity stuck somewhere in between. Under this scenario, the votes for candidates with Experience outnumbered those votes for candidates who promised Reform. If people are consistent and vote the same interests in the Runoff election, it would stand to reason that Preckwinkle would be the next Chicago Mayor. But Chicago politics is never that simple. Both Preckwinkle and Lightfoot have a long history of working inside of the Chicago Political Machine. Preckwinkle as an Alderman, County Board President, and Chairman of the Democrat Party. Lori as head of the Chicago Police Department’s Office of Professional Standards, as Daley’s Chief of Procurement, as the head of Rahm’s Police Board, and as a partner in a well connected downtown law firm. Preckwinkle, a well known politician, has had her share of problems connecting with voters. Many were turned off by her sugary drink tax debacle. Still, those that voted for Toni knew who they were voting for. Arguably, her base of voters will remain solidly behind her. On the other hand, most voters hardly knew Lightfoot. In an artful campaign, fueled by Northside political activist, she emerged as the most strident alternative to the plethora of well known Machine candidates. Many who voted for her did not really “know” her. As the campaign wears on, and voters are able to take a closer look at Lori, many are disappointed to find she is not the classic reformer or outsider they thought they voted for. Consequently, many are having “Voter’s Remorse.” Now that the fog of “too many candidates” has lifted, and we’re down to the final two, Lori may not appear as attractive as she once did. Those who previously cast a vote for her, may be having second thoughts. If the election were held a week ago, Lori would have been a shoe in. However, as the election wears on, and more of Lightfoot ‘s background is revealed, support for her seems to be eroding. 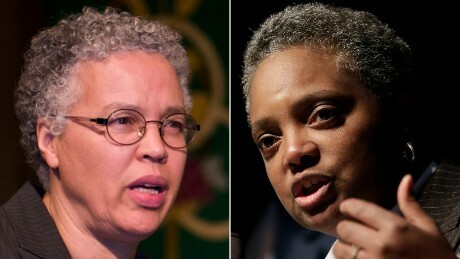 Lori Lightfoot is member of the machine that supports VanDyke who murdered McDonald , FOP , Code of Silence and Police cover-ups of misconducts inclusive of murder and brutality.